I’ve been in India for three weeks now and it’s flown by. 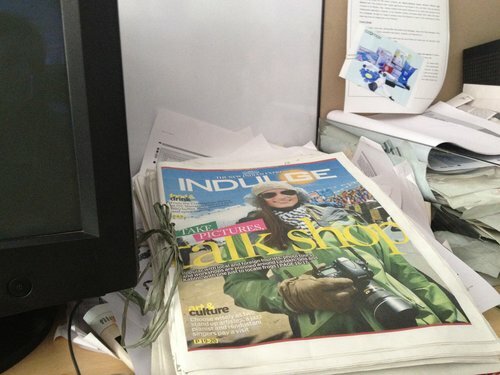 I’m working for a newspaper in the Indulge lifestyle magazine, which comes out every Friday. This is briefly what I have done for the magazine so far, a few of the articles will come out in the next issue. 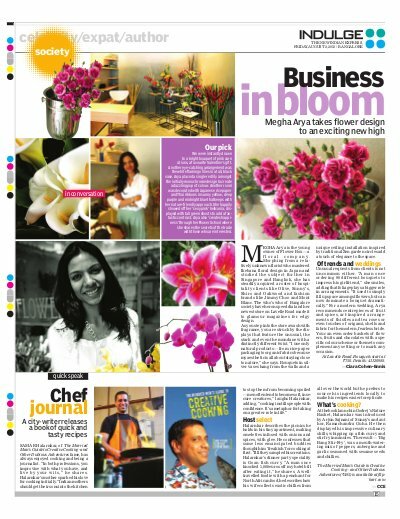 In my first week I interviewed Megha Arya, a flower designer who mastered in Ikebana in Japan. She was really kind and welcoming and gave me green tea and cupcakes as soon as I got there. 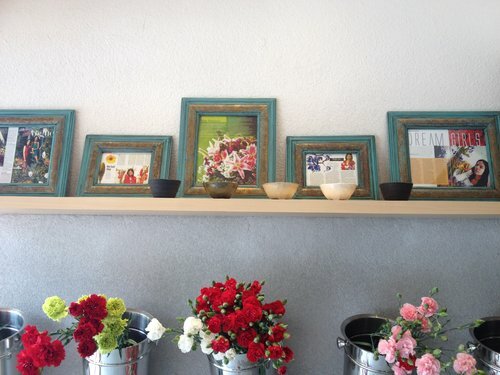 She has also studied in Singapore and Thailand and is really interested in the spiritual, therapeutic side to flower arranging and doesn’t like using anything artificial. 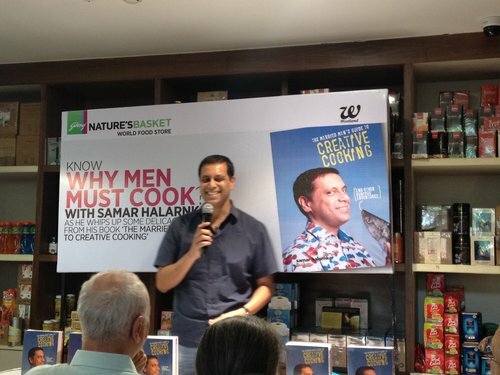 I’ve been to a few book launches, the first was for A Married Man’s Guide to Creative Cooking by Samar Halarnkar, journalist/chef. His book is a funny compilation of recipes and stories about his life and growing up. His mother encouraged him and his brother to learn to cook and be self-sufficient from a young age, so he’s now trying to get other men to do the same, which is great. The second author I met was Shiv Kumar Thakur, who was promoting his first novel, Price Tag on Love. It’s about the dowry system in India, which he strongly opposes, as well as discrimination which goes on in the country based on the language people speak or the region they come from. Nine businesses in Indiranagar, Bangalore, have joined together to create a loyalty card program for customers. This includes a spa, music venue, restaurants, shops, etc. 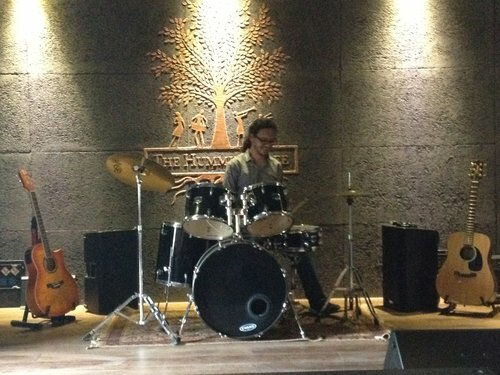 The launch was held at The Humming Tree, which is a new venue in Bangalore for up-and-coming bands from all over the world. It also has a European and Mexican restaurant. I got to interview the owners of the businesses and check out some of their products. In the office, I’ve been working on fashion page with one of the other interns. Bangalore fashion week starts next Thursday, so I’m really looking forward to seeing the local designers with their Autumn/Winter collections. This morning I went to the Grand Mercure Hotel for the launch of their Grand Vins. This involved a lot of wine tasting, which I’ve never done before. The guys at the hotel showed me how to wine taste properly and even had funny way of bringing out the fruity flavour by holding the wine in your mouth and breathing in. Apparently this makes it go to your head faster… Bit of a change from buying £5 bottles at uni. I met some really nice people at the Mercure, including a girl who is going to study at Birmingham City University in September. She’s only 20, but has been accepted there to do an MA program. After tasting the wine, we tried our hand at grape stomping. This initially felt disgusting, but we got into it after a while and probably crushed about a million grapes. On my way back to the hotel, I got absolutely drenched. Luckily I was able to get a rickshaw, but the traffic was awful and the roads were really flooded. Happy monsoon season!